We are looking for every kind of hints leading to vintage Volkswagen cars, sitting somewhere being abandoned and waiting for love. In Austria, all of Europe or the entire world! 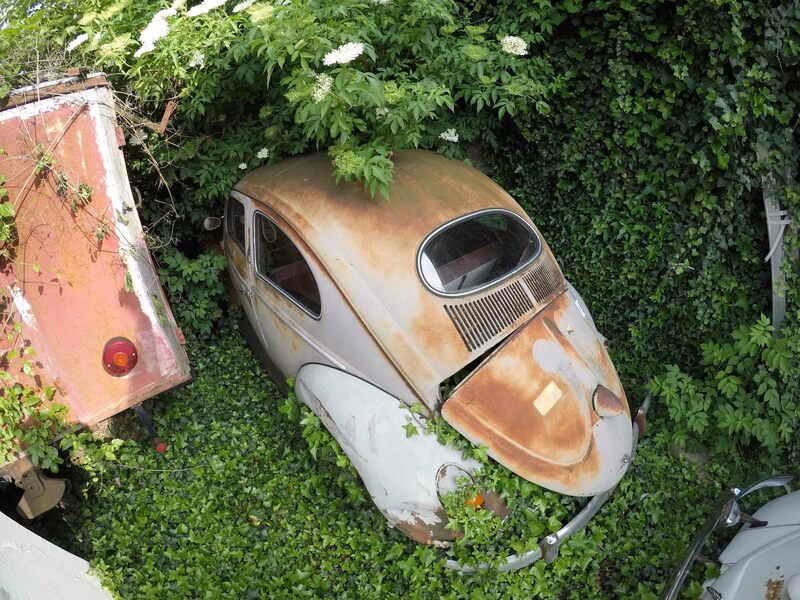 As real passionate fans of VW Busses as well as beetles and other aircooled cars we do have the opinion that every old Volkswagen needs to be saved, no matter how bad the condition is! 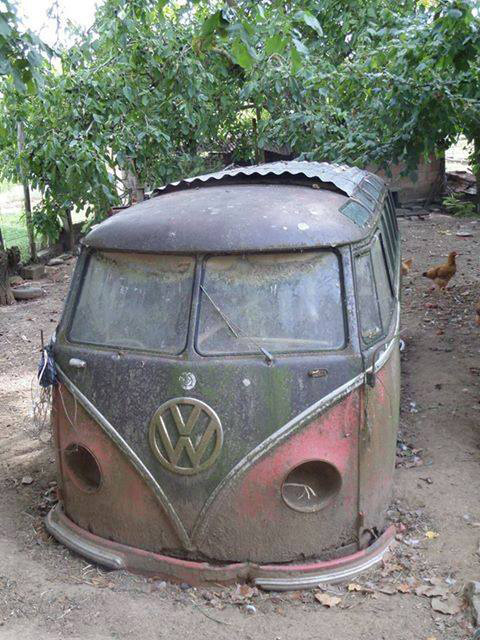 Is there a old VW Bus sitting in your neighbors garage? Did you inherit a classic Volkswagen and want to separate from it? Did you stumble over a car wreck in the forest? Do you want to sell on of you aircooled VW projects? Is there a dusty treasure sleeping in your grandparents barn? Do you feel sad for a local car with flat tires that has not moved for a long time? 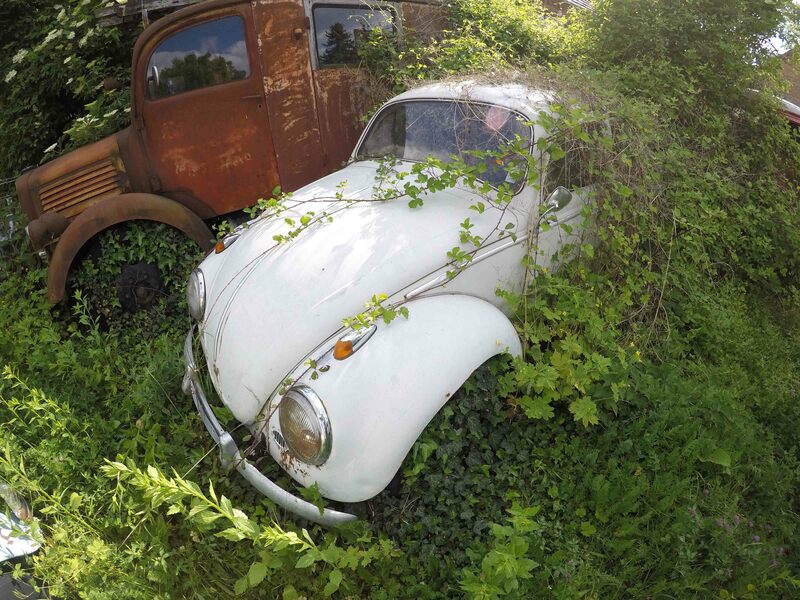 Are you giving up your oldtimer collection full of Volkswagen cars? 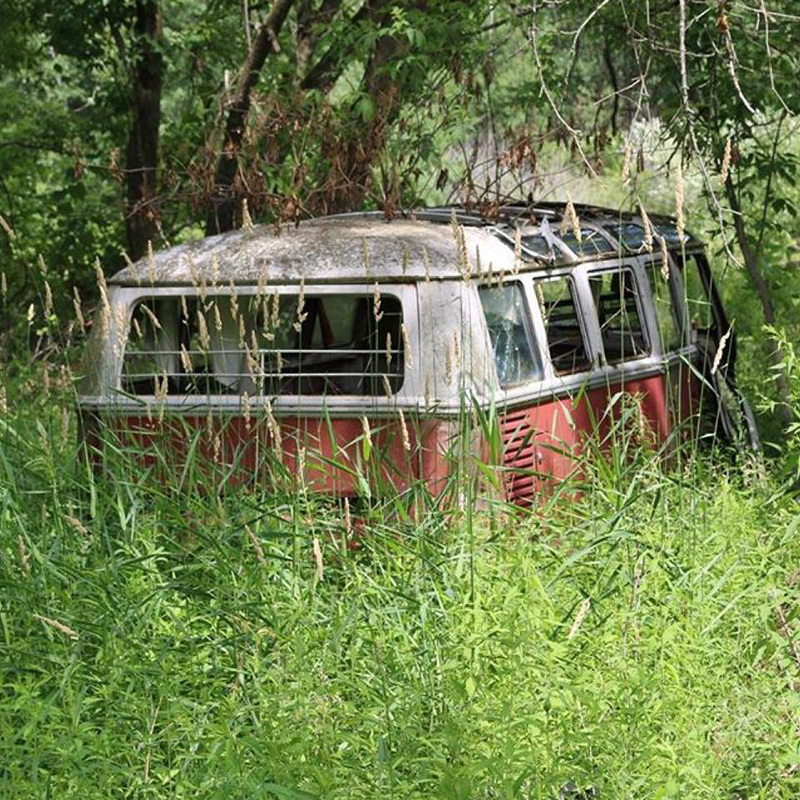 Did you spot a rusty VW wreck on an abandoned property? It may be a perfect restored car, a one-owner surviving car or even a rusty wreck. As absolute lovers of those old cars we would like to know about every find and the story behind it. Who knows.. it may be a new project for us – and if not we definitely can convey it into loving and caring hands that bring a car back on the road again! Already back when I was in school I started to build a network of VW contacts all around the globe. With my interest in old Volkswagen buses and especially the ones in very bad condition I even was able to convey a few cars. It all started with a facebook page that I created, hoping to find a cheap project for my own. The topic of this blog was all about bus wrecks – I asked people to send me their bus finds, collected their pictures in an album and shared their stories on my page again. And it worked, I received plenty of bus find stories from all over the world. But sadly I always was to slow or too inexperienced to strike a deal. 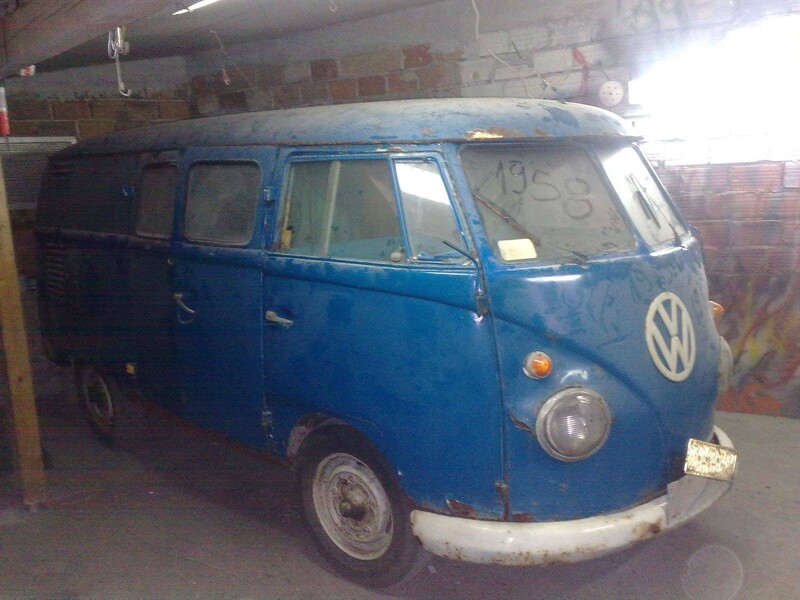 When it all started in 2012 i had the opportunity to buy the one or other so called „Barndoor“ bus from the very early 50ies. But as I was a poor student I missed those chances mostly because the recovery of those buses as well as the transport to Austria would have been very laborious. Today I am of course sad and angry that I missed on those cars but I learned from that and won’t fail again! The good thing about it is, that I really got in contact with lots of people from all around the globe – I received messages from Norway to South Africa, from America to Asia. Even after chatting one evening with a guy from Australia, he invited me to give me a sightseeing tour through Sydney in his 1954 Samba – if I ever come there. Sadly my travels have not lead me to Down Under yet – but if i ever go there you will definitely read it in AustroSplit blog. Additionally I will also receive a tour to all of the most important VW gatherings in California by a local enthusiast, if I ever get there to. There are lots of friendly people out there in the VW scene! And you would not believe what some of those VW bus are able to do. The best example is my friend Mark from United Kingdom, i mentioned him before as he is the one who built up the Kohlruss Bus again. He is a true welding magician as he saved as much as original metal as possible. 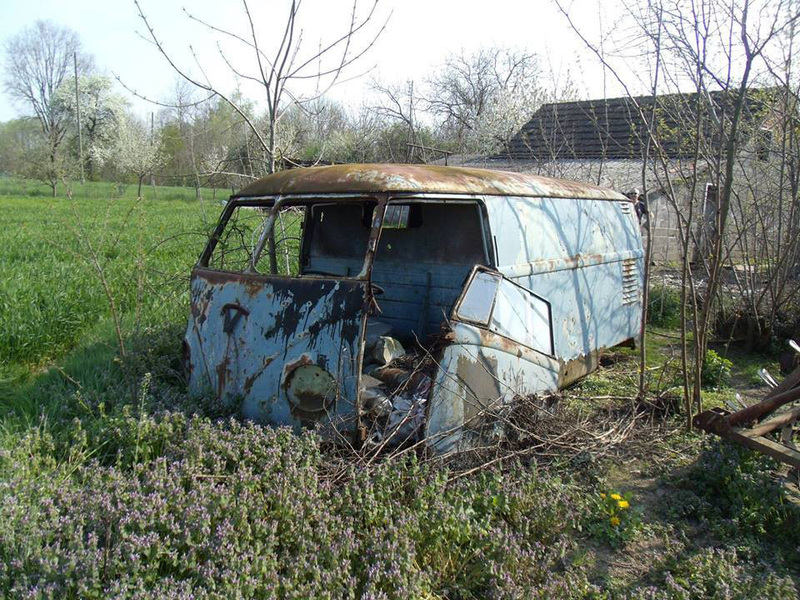 Another example is our buried chassis of a very early VW Transporter – manufactured before mid 1953! It is in Styria now and will be used to build a new bus again. It will be a very unique project, i will keep you updated! Or let me introduce Ben. He is also from UK. 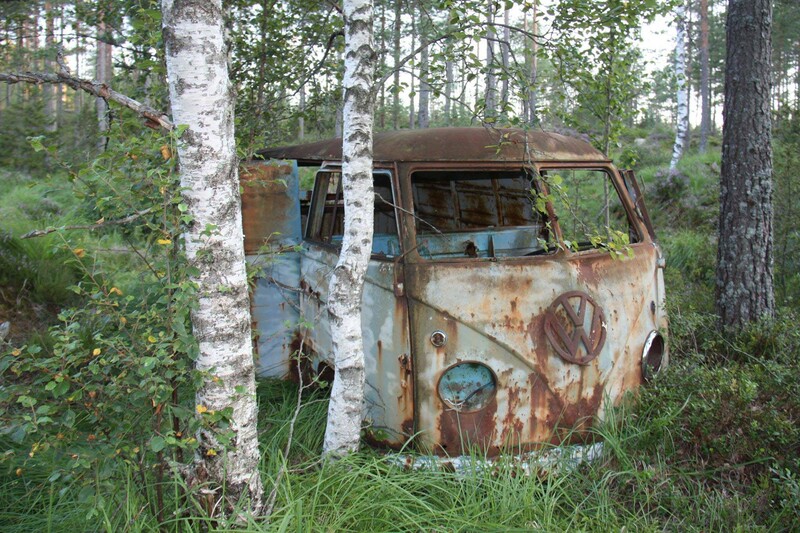 Through a web search I discovered this wreck of a VW panel (shown in the two pictures above). It turned out to be one of the oldest RHD VW panels – built in 1952. But the most special thing is that Ben already owned another panel with a chassis-number that was just 7 numbers apart. So this wreck might even have been manufactured in the very same building on the very same day – being just a few moments younger than his other bus. Of course it was clear to me to tell Ben about it and convey this VW to him – as always for free. 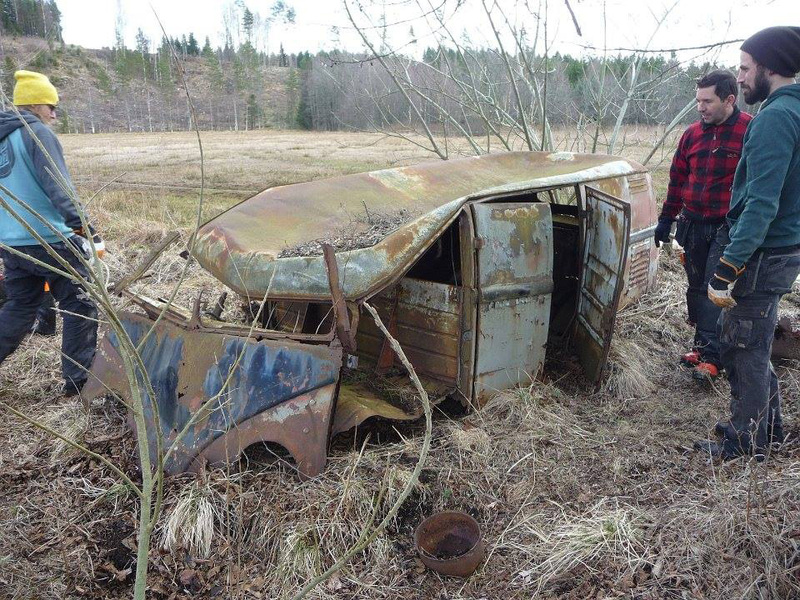 He still had to a big effort to salvage those bus remains as he lived 2.500 kilometers away from its last resting place in Sweden. Additionally the area was a swamp, so he could pick up the bus easily. No car or ATV would have been able to go there, so Ben and his helpers improvised. As the body of the bus already was loose and not connected to the chassis anymore, they could lift it and drag it to their trailer by hand. Normal people would say this wreck is a case for the scrap yard and just good for the junk press – but I forgot to mention that Bens other panel was also found in similar condition, before he restored it and made it roadworthy again. 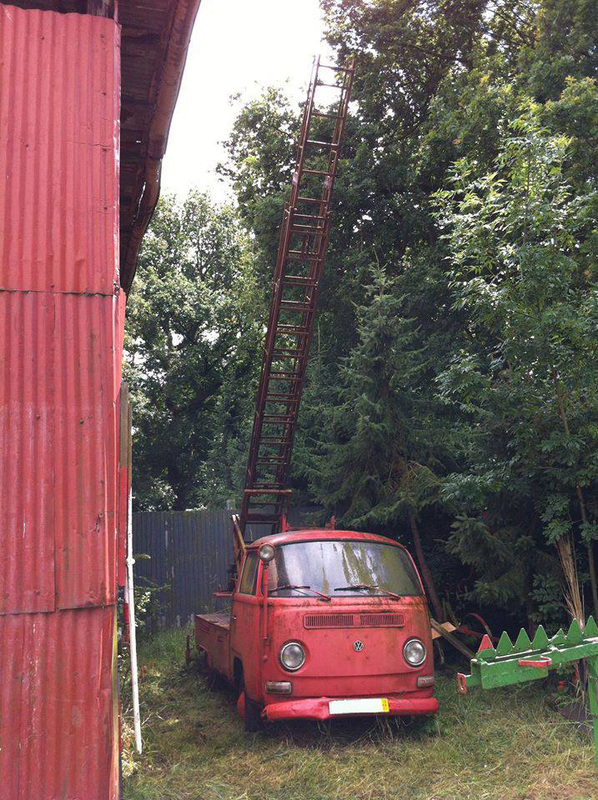 Over the last years i got to know many interesting people from all over the world and so I saw quite a few impressive barn find stories and unbelievable photos of old VW buses. 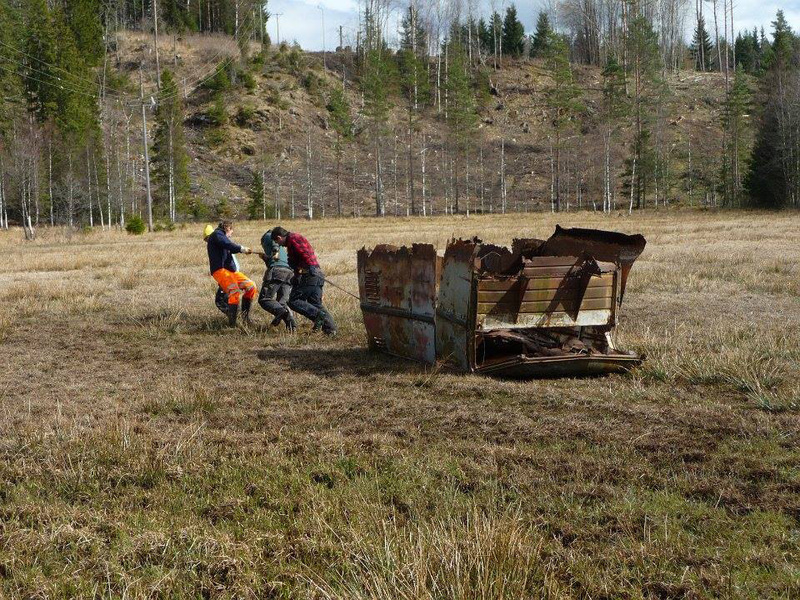 For example in the pictures below you can see two coveted finds. 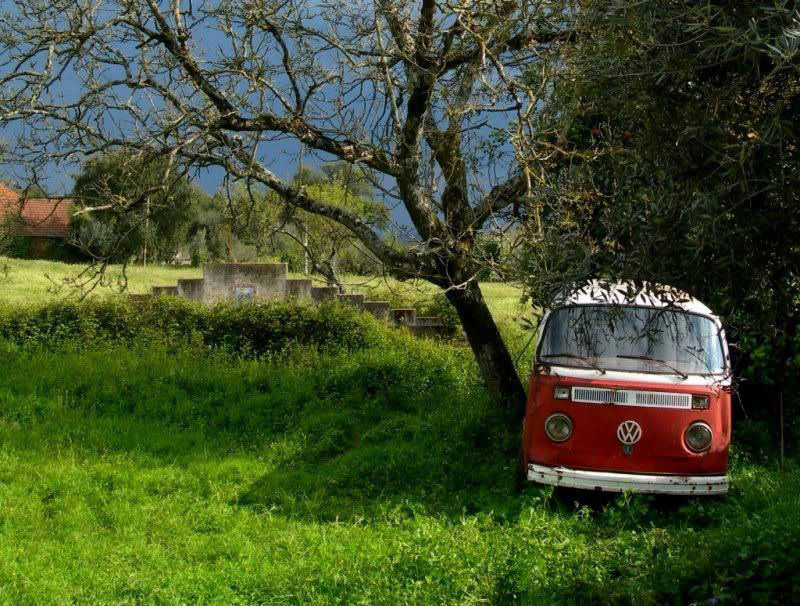 On the left you can see a 1951 VW bus panel as found in Greece. 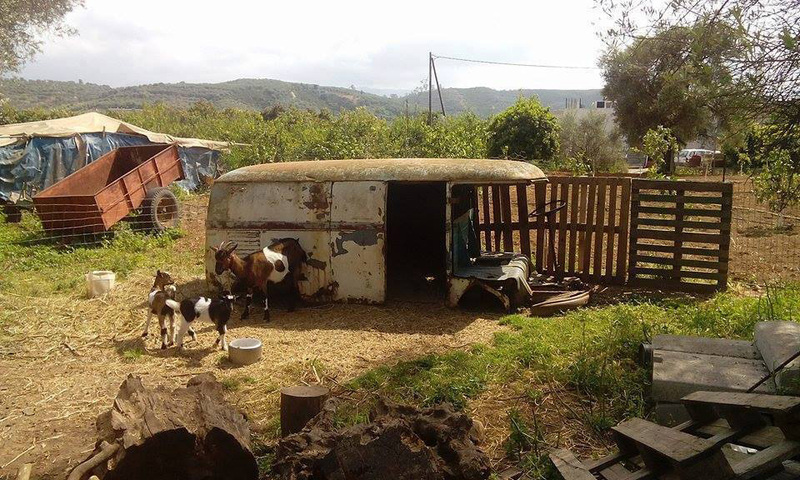 The owner used it as a goat shelter until it was saved in 2015. In the meantime the restoration is almost finished and soon it will be driving through the streets of Austrias federal state Burgenland again. The other photo is more recent. It was sent to me by a dutch guy who was on holiday in Florence, Italy, as he discovered this 1957 Deluxe Bus. Here the owner also used it as a a chicken coop for years. But now its already driving through the Netherlands again. I i would have known about those buses, I would have gone there immediately to bring them home – what sensational finds! 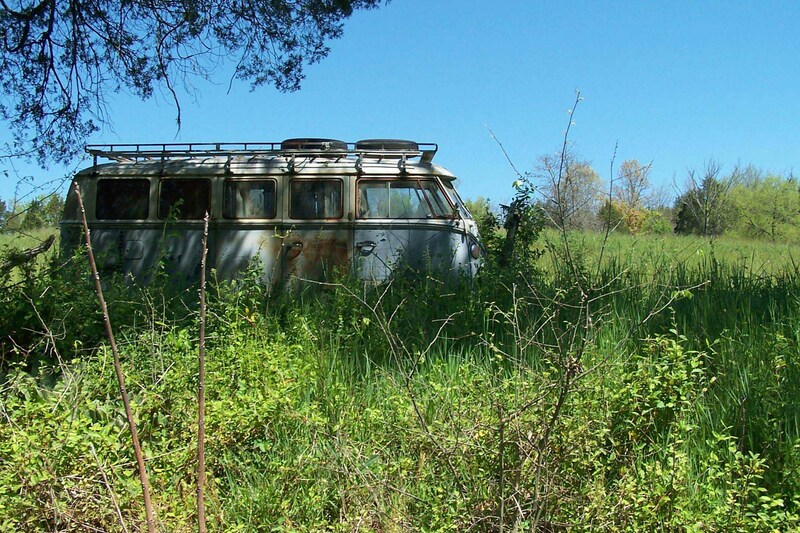 The next two buses were both neglected, both on an open field .. and both in USA. I discovered them by browsing on Social Media. The red one on the right is a 21 Window Samba. I was told that it sat there for decades, was left there pretty close after it was purchased back in 1967. The condition of the body looked quite good, but it was kind of a flintstones-vehicle as the of sunroof caused a lot of damage on the passenger floor, and raccoons did their part too to abandon this bus. 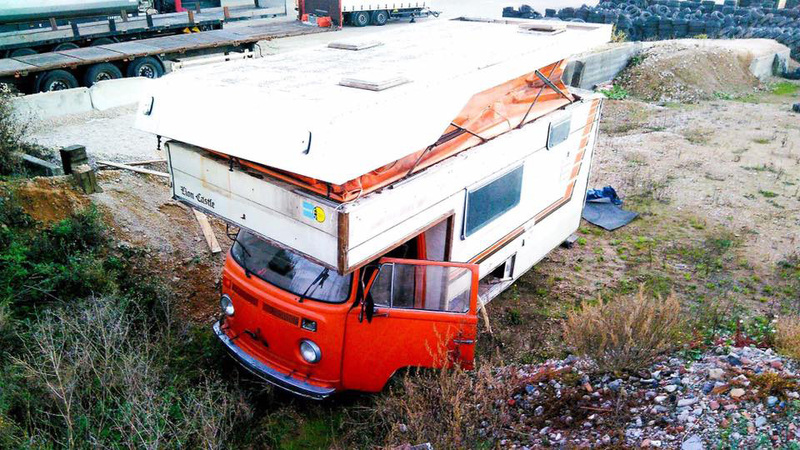 But nothing that can’t be fixed – so in 2016 this deluxe bus was dragged out there and sold to local VW lovers. With the bus on the left i fell in love quite recently. In December 2018 I discovered it on Facebook and contacted the photographer. He lived nearby and took this pic of the bus during a walk in early 2017. He was quite friendly and helped me to do some research about the bus. I really was interested as the bus was a 13 Window Deluxe model, just like our bus „Eve“. Additionally it appeared to have a nice original paint and an awesome long roof rack. But sadly just months before a guy stopped by and bought the bus from the owner. Incredibly the former owner told us that the bus sat there – under a tree right next to the street – for more than 10 years, without anybody ever asking for it. So I had bad luck as the VW T1 bus was already gone.. Too bad – I would have been crazy enough to travel 7.700 kilometers to Tennessee, USA, to pick it up! I guess you already noticed that I am really obsessed with this topic. And I still could continue writing about it but I want to finish this article now. 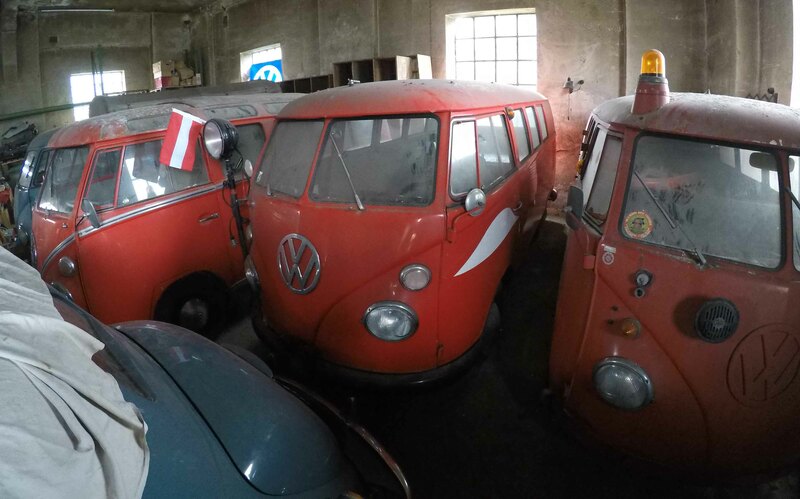 I would really be happy if you contact me and tell me about your VW-barn find stories – in Vienna, Austria, Europe or the whole world. No matter if its a Bus, a beetle, Kübelwagen, Ghia, … none of this cars should be scrapped even though it might be in very bad condition! I am looking forward for your messages – thanks in advance!